I had some nice organic pastured ground lamb from the Whole Earth Center, and mixed it lightly with bread crumbs, milk, an egg, and plenty of dried mint. 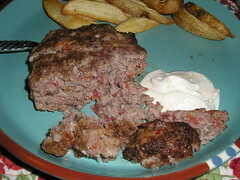 I broiled the patties and enjoyed them with some yogurt on the side. I may have just used plain yogurt, although I love Trader Joe’s raita and tzatziki. but sometimes I mix it with a little masala or ras el hanout when I don’t feel like going through the whole grated cucumber thing. I don’t usually keep much salad stuff around in the winter. The oven-fried potatoes-not home made, alas, but frozen. They were too dry; maybe I over baked them, wanting them to be nice and brown.